Under the Patronage of Her Highness Sheikha Latifa Bint Mohammed Bin Rashid Al Maktoum, Vice Chairman of Dubai Culture & Arts Authority, and in association with The Grand Prix d’Horlogerie de Genève, the UAE’s leading retailer of Swiss watches, Ahmed Seddiqi & Sons is hosting the first edition of the Dubai Watch Week, a global event dedicated to the craftsmanship and innovation in the watch industry. The Dubai Watch Week will take place from 18th to 22nd October 2015 at the Dubai International Financial Centre and will offer a journey of discovery into the world of fine watchmaking, through a cultural and educational platform that will include the exhibitions, forums, watchmaking master-classes, and an auction. During the Dubai Watch Week, Ahmed Seddiqi & Sons is also organizing a non-commercial public exhibition around the Dubai Mall’s Grand Atrium area, where leading watch brands will showcase some of their most exceptional pieces. For this special occasion, de GRISOGONO is pleased to announce that one of their most incredible watch creations, CRAZY SKULL, can be admired for the first time in the Middle East, as part of this exhibition. Celebrating life in the most irreverent and playful way, CRAZY SKULL is a one-of-a-kind masterpiece that is the epitome of the art of watchmaking and jewelry, admirably showcasing the brand’s dual expertise. By proposing an endearing character, de GRISOGONO introduces an original and unique design. With this talking piece, the brand’s Founder & Creative Director Fawaz Gruosi once again challenged the fundamentals of traditional watchmaking and jewelry and demonstrates his ingenious and exuberant creativity; a non-traditional approach that speaks for itself. 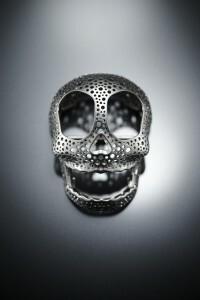 Artfully designed and featuring rare and precious materials, CRAZY SKULL required almost a year of research and development and approximately 250 hours of intricate jewelry work in a subtle blend of know-how that lies within a close collaboration between skilled master watchmakers and top craftsmen such as gem-setters, goldsmiths, diamond-cutters and polishers. The CRAZY SKULL S02 is composed of almost 900 snow set white diamonds and features a dual-time display representing the eyes, set with black and white diamonds. The nose is made of an exclusive 1.5-carat heart-cut white diamond and the teeth are composed of 7.70 carats of sparkling invisible- set white baguette-cut diamonds. When the lower jaw is triggered, the CRAZY SKULL cheekily sticks out its precious tongue set with pink sapphires or rubies. CRAZY SKULL S02 – Caliber SF 10-44 – Quartz / Function H, Mn / Case White gold full set with 891 white diamonds – 22.15 ct 1 heart-cut white diamond – 1.50 ct 20 baguette-cut white diamonds – 7.70 ct 66 pink sapphires – 0.95 ct / Dial Black lacquered, white gold, 78 white diamonds – 0.50 ct 92 black diamonds – 0.55 ct / Strap Black galuchat / Clasp White gold set with 359 white diamonds – 3.95 ct 2 white diamonds – 0.40 ct About de GRISOGONO and Fawaz Gruosi Since the brand’s establishment in 1993, Founder and Creative Director, Fawaz Gruosi dynamically drives de GRISOGONO. He is a creative force, full of energy, known for a ‘lust for life’ that is as exuberant, opulent and celebratory as his creations. Creativity at de GRISOGONO is proliferate and spontaneous, stemming from Gruosi’s singular approach, characterized by impulsiveness, intuition and impatience, overriding all rules and conventions. Driven by his rich cultural background, de GRISOGONO is infused with a Mediterranean character that fills its creations and activities with emotion, purpose and intensity. Fawaz Gruosi is described by most as ‘daring’ and ‘able to push boundaries’, a trailblazer, ready to take risks in his quest for difference. He leaves his mark on every single piece. This is what makes up de GRISOGONO’s iconoclastic, audacious and free identity, often enhanced by a touch of humor. Independent from prejudices and preconceptions, de GRISOGONO favors new ways of creating jewelry and timepieces and constantly rewrites the rules of the industry. 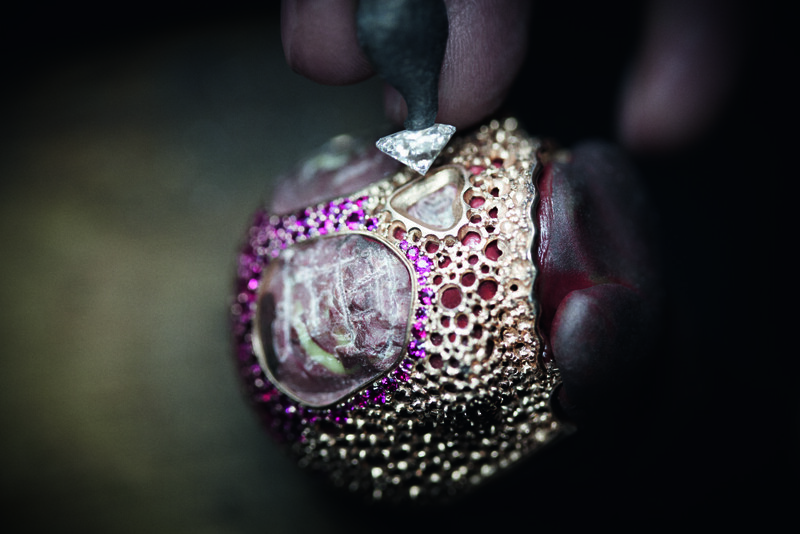 22 years of disruptive creations illustrate the full range of de GRISOGONO aesthetic constants.